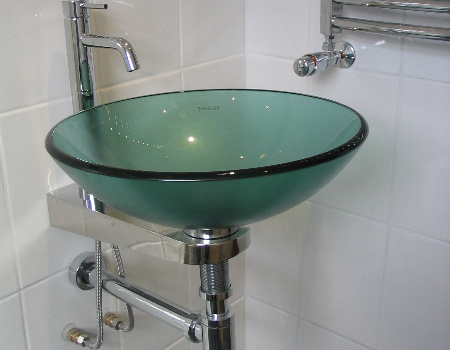 Bathroom fitter with many years of experience in the property refurbishment. We provide a full spectrum of bathroom set up services. Whether it is a new bathroom, wet room, shower room, tiling or plumbing look no further. We have lots of experience working with man made materials – ceramic, porcelain or glass and natural materials – slate, granite, marble, limestone or travertine. We are the bathroom renovation specialists, with many years of experience, and we cover West London from Kensington to Hanwell and surrounding areas. Our estimates are very competitive. You call us for a free estimate. After a proper survey and after we clarify with you what you want to have done we will give you clear estimate. If you accept the quote we are going to search for the products at the best possible price. Having a few years of experience as bathroom fitters in London we know what fittings and sanitareware would fit your project best. We let you know in advance how long the bathroom refurbishment would take – so we’d inform you how long/if your lavatory might be out of service. We work daily ( from 8 am to 5 pm), keeping to the schedule. After work is finished, We tidy up and clean. You can be certain your private home and belongings will be treated with respect, mud sheets used, correct care taken. I will happily second another poster’s comments, it was a pleasure having Jacek and his team onsite refitting completely our bathroom. They were attentive, hardworking and I happily recommended them already to our three neighbours. Very happy with the job. Small but fiddly and a bit more complicated than Jacek had thought. But he dealt with it well. Very hard working, arrived on day we agreed, started every day around 8 and finished around 5 ish. Tried hardest to be neat and tidy. No music! just hard working and would recommend them to others. I would thoroughly recommend Jacek and his team to anyone looking at this site and considering using them. They did our bathroom and we were thoroughly impressed. You can see the photos in the gallery!